There’s no better place to celebrate Valentine’s Day in San Diego than in one of the city’s most romantic neighborhoods — Little Italy. From the top drink spots and one-of-a-kind shopping to the best places to stay and dine, Little Italy has everything you need for a seamless evening with your significant other. Valentine’s Day gifts are just as important as dinner reservations on this special day. At Little Italy, there are many local boutiques that offer unique and thoughtful gifts for that special someone. For him, check out Atacama Surf Shop and for her, you’ll find accessories and fashionable clothing at Vocabulary or Little Apple. If you’re looking to get the perfect gift for the home that you both can enjoy, check out Vitreum or Love & Aesthetic. To kick off the perfect evening, visit one of Little Italy’s top bars like King & Queen Cantina, Kettner Exchange or Nolita Hall and grab a few cocktails or delicious appetizers. Selecting a restaurant in Little Italy is easy, especially with plenty of great options. If you’re looking for a quaint, intimate restaurant make a reservation at Buon Appetito, where you can find generous plates of Italian cuisine and a spectacular wine selection. Other eateries to check out for a memorable evening include Born & Raised, Juniper & Ivy, Barbusa, Ironside and Little Italy’s newest dining experience, Farmer’s Table. There’s nothing like ending the perfect night indulging in sweet treats with the one you love. Grab some chocolate tartes or crème brulee at Extraordinary Desserts, a scoop of flavorful gelato at Pappalecco or an exquisite pastry from Nonna + Café Zucchero. After dessert, stroll through the lively neighborhood and stop at the recently opened Piazza della Famiglia to enjoy charming views of the San Diego Bay under the twinkling overhead lights that will be lit red for amore. Nothing says a romantic evening like sharing a bottle of wine from the Little Italy Food Hall underneath the stars in the piazza. To surprise your lovebird and show them how much you appreciate them, plan a staycation at La Pensione, a modern, chic boutique hotel located in the neighborhood or the Porta Vista Hotel with beautiful views of the neighborhood. Little Italy makes it easy to prepare for Valentine’s Day as a one-stop destination for all — gifts, cocktails, appetizers, dinner and a sweet nightcap. 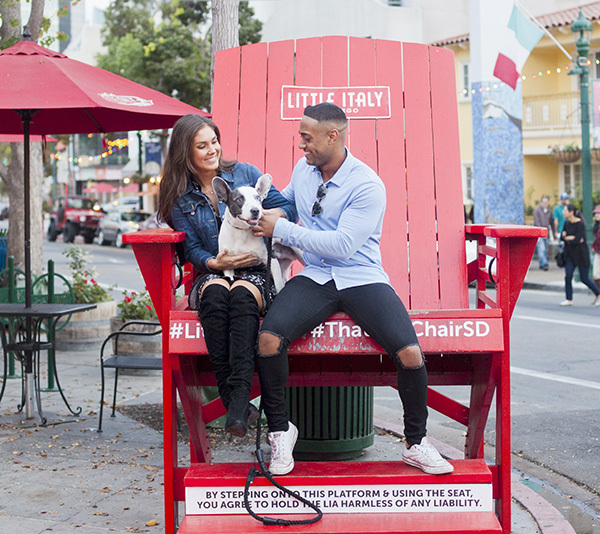 To stay connected with Little Italy, check out what’s going on in the neighborhood by following the community on Instagram and Twitter: @LittleItalySD and Facebook: LittleItalySD. To learn more things happening in the neighborhood, visit LittleItalySD.com. —Christopher Gomez has been Little Italy’s district manager since 2000. Reach him at chris@littleitalysd.com.